A phone without any Internet connection is far better than slow Internet. At least, you don't have to check the downloading progress every second and most importantly, it saves your precious time and phone battery too. You might have faced this problem many times when you're downloading your favorite video song and Internet is running very slow, close to the speed of turtle. Undoubtedly, it's the most frustrating thing which can ever happen to anyone, especially to those people who hates to wait. Right? If we will talk about Android phones, they are well optimized to provide better user experience while surfing Internet. As nothing is perfect, they also sometimes get very slow when it comes to downloading. In fact, downloading speed depends on number of factors such as phone's performance, network provider, network signals, browser, apps running in the background and many other things. It would be pointless here to blame your Android phone only. Now the question is, how one can boost up the downloading speed? This is what we are going to discuss today. 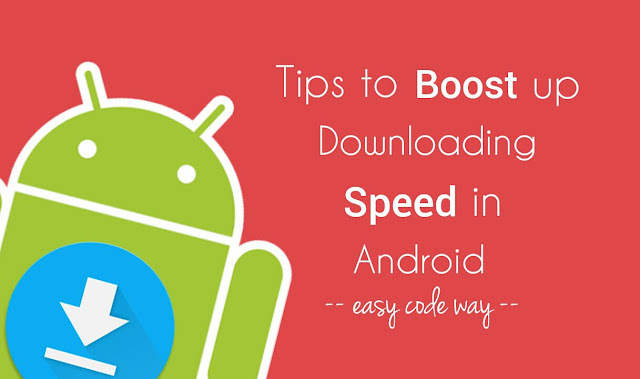 Here are few essential tips which can help you to increase the downloading speed in your Android phone and good thing is that, there is no need to use any third-party app. You might have hundreds of apps installed in your Android phone. But did you know that these apps are the main culprit to slow down the downloading speed. They also use unnecessary mobile data in your absence. Apps and their services are always running in the background 24/7. They do so for some good reasons such as for syncing purpose, providing location data, push notifications and to keep you updated with latest activities. While on the other hand, apps running in the background also affects device's performance, RAM usage and drain battery life. After all, they were made to keep user interface (UI) in mind, not user experience. App developers are more interested in to provide better animation and graphics, rather than monitoring the app data usage. 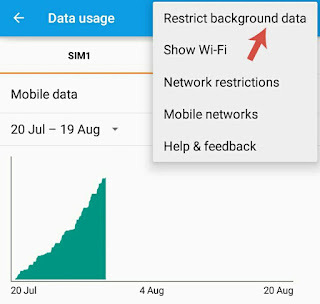 In order to solve this issue, Android has added an option which let you restrict apps background data so that apps running in the background can't use your mobile data. Only the current active app you're using can use mobile data. For example, if you're using WhatsApp, you'll get all messages as usual but when you'll leave the app, WhatsApp Internet connection will be disconnected. First of all, go to "Settings" and click "Data Usage" option. Now click the menu button (three dots at the top-right corner of the screen). From the menu list, tap "Restrict background data" option and then a pop up box will appear. Click OK to allow permission and that's it. After this, a new sticky and non-removable notification will be added in your phone's notifications tab, which reminds you that background data is restricted. If you want to remove this restriction, either tap the notification or manually turn it off from "Settings > Data Usage > Allow background data". Note that, when you're downloading anything, make sure that the browser app is active, otherwise it may not get access to use mobile data. Android also has an built-in monitoring tool to check your apps data usage. I had already discussed about this topic in my previous article, which is worth reading. Are you one of those people who used to check your mails and Facebook news feed side-by-side while downloading anything? If yes, then you should stop this. It's very important to stop all data-consuming tasks. We had already restricted background data for all apps running in the background and now it's time to stop surfing the Internet. There is no doubt in fact that, the less data usage will be, the more fast downloading speed will be. As simple as it sounds. Here's a brand new tip: In some Android phones, Internet will automatically stop working when it's not in use for a longer time (say more than 5 minutes) or it will slow down the downloading speed to few KB/s only. Make sure to check the Internet connection after few minutes. The best way is to visit the Google homepage. This trick will help you more when you've restricted background data. 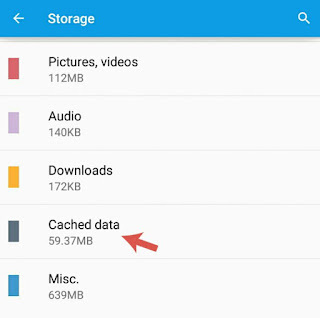 After a long use, a lot of cached data is saved in phone's Internal and RAM memory. If your phone is running out of low space, it can badly affect your apps performance. They may start hanging, crashes automatically or slow down the speed. Again go to "Settings" and then click "Storage". Under device memory section, tap the "Cached data" option followed by OK button and that's it. Note that, deleting this cached data is completely safe and there is no loss of data at all. Furthermore, this can free up hundred MBs of space in your phone's Internal memory. UC Browser will divide files in small packets and then download them simultaneously. For example, If you'll download a video, it will divided it in 2 or 4 parts. Even If the downloading is in progress, you can play the video in these intervals. You can easily check the file size, download progress and the approximate time remaining along with the downloading speed. You can also pause the downloading any time and then start it again from the same point. If you really want to get super downloading speed, then go ahead and install UC Browser now from Google Play Store. Once after installing, you'll get to know why I am saying this. You may not believe but the time also plays an important role in downloading speed. If too many people are using Internet at the same time in your locality, it may affect your phone's signals and downloading speed, as server may be busy at that time. What I had observed is that, the downloading speed is much better in night and early morning time. Though I don't have any technical explanation for this, but this thing works for sure. It's better to try it yourself. Again you can use UC Browser to measure and compare downloading speed at different times. Meanwhile, the world is going at 5G speed, if you're still using low 2G internet connection, then you've no reason to complain about slow downloading speed. Be updated with latest technology. At least, migrate from 2G to 3G, that would be a great change in itself. Or better use Wi-Fi connection which are quite cheap everywhere and will cost you same as your mobile data bills. One of the major drawback of using 3G Internet is that, although you'll get the fastest downloading and surfing speed but data will be wasted at much faster rate. The same Internet pack will you use for 1 month in 2G, may finish in less than 15 days in 3G. So it's better to use Wi-Fi. Sometimes low downloading speed could be the carrier's fault and you can't do anything for that. If there is no tower in your locality or if there is some technical problems, you can explain it to your network operator so that they can troubleshoot it as soon as possible. Otherwise, you can move on and change your network operator. Now its even possible to migrate from one operator to another with the same mobile number. There are hundreds of choices available. For people living in India, Airtel is undoubtedly the best network which provides fastest surfing and downloading speed. Also, make sure to get the 3G data pack. You might be downloading multiple files at the same time. Well if you're in hope that it will boost up the downloading speed, then you're damn wrong. When multiple files are downloading simultaneously, speed will be divided among all files and as a whole, the net downloading speed will be affected. So it's better to keep calm and just download a single file at a time. Apart from these methods, there are a couple of third-party apps available on Google Play Store for free which claim to boost up the downloading speed. But personally I find that there is no need to use them as we have other better options and so far, UC is undoubtedly the best browser and app to download files at much faster rate. So these are some of the basic tips which may help you to improve the downloading speed in your Android phone. Now what are you waiting for? Go and try these methods. If you've any questions, feel free to drop them in the comments. Stay tuned for more interesting tutorials. Did I had missed something?